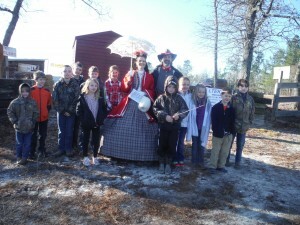 A group of home schooled children stand with Justin and Tonya Guy in period dress at the entrance to the Battle of Aiken. Pictured are left to right: Grant Rauton, Wyatt Roberson, Whit Miller, Makena Rauton, Jackson Graham, Bennett Graham, Haviland Graham, Tonya and Justin Guy, Asher Ireland, Ella Mathis Miller, Gracie Roberson, Whittaker Graham, and Knox Rauton. 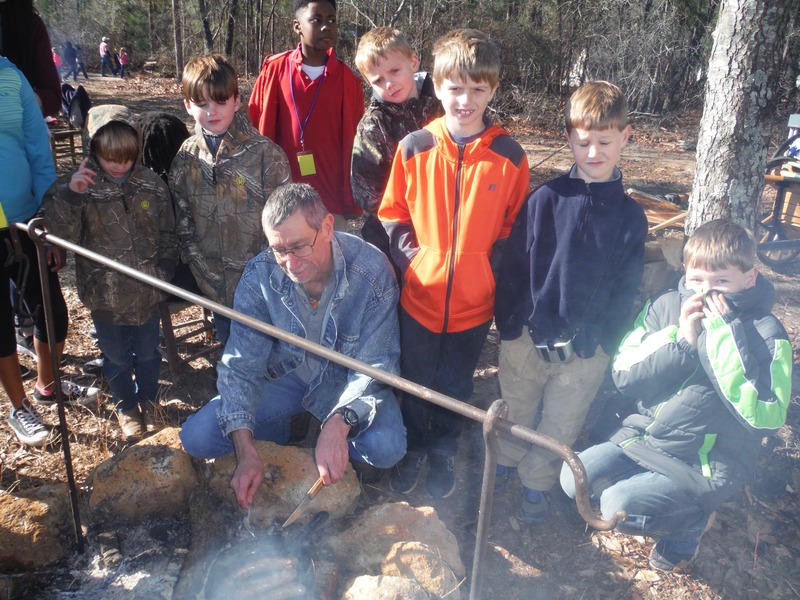 Civil War re-enactors and living history demonstrators converged on Powell Pond Road in Aiken, SC, over the weekend for the annual re-enactment of the Battle of Aiken. The historical weekend began Friday, Feb. 19, with School Day. Students from local schools as well as many area home schooled children visited the site to see demonstrations of life in the mid 1800s and to learn about the War Between the States. They were also witnesses to a small, shootout type gun fight between a handful of Confederate soldiers and their Yankee foes. Of course, the Gray Coats won. However, the big battles were saved for Saturday and Sunday’s events. Locals seen Friday lending their talents to the event included Ike Carpenter, Justin and Tonya Guy, Keith Sexton, and John Martin. The Battle of Aiken was actually fought in what is now downtown Aiken on Feb. 11, 1865. As a re-enactor portraying Confederate Maj. Gen. Joe Wheeler (the hero of the Battle of Aiken) explained to those in attendance on Friday, the Battle Aiken is considered the last Confederate win before Gen. Lee’s surrender two months later. Although not one of the major battles usually noted by those studying the War Between the States, the Battle of Aiken is in fact considered vital to the survival of Aiken and Augusta. Union General William Sherman had begun his invasion of South Carolina days earlier on Feb. 1, 1865. Sherman’s cavalry commander, Brig. Gen. Hugh Kilpatrick (known as “Kill Cal” for his reckless tactics that resulted in the death of many of his own troops), entered Barnwell by Feb. 5 and burned the town, renaming it Burnwell. His plan was to move onward to Aiken and burn it and the cotton mills in Granitville which supplied most of the cotton for uniforms for the Confederate soldiers. He then planned to advance to Augusta, Ga., where he would attack and burn the Augusta Arsenal another major supplier of the Confederate army. However, Maj. Gen. Wheeler had planned a trap for Kilpatrick. The trap forced Kilpatrick to retreat to his defensive position at Montmorenci. Thus, Wheeler successfully stopped Kilpatrick, and on Feb. 13, Kilpatrick left the area to rejoin Sherman on his march toward Columbia. According to writer Pete Peters, whose description of The Battle of Aiken was passed out to attendees over the weekend, Wheeler’s tactics saved Aiken, as well as other targets, and is credited with preventing the destruction of a local capital and its economy. His win not only saved Aiken but is also credited with positioning the region to better withstand the Reconstruction era which followed the war and which had a much more negative impact on other, more devastated, areas of the South. The re-enactment of the Battle of Aiken is held each year in February at the Powell Pond Road site. For more information about the battle, this year’s event, or next year’s re-enactment, please visit www.battleofaiken.org. Keith Sexton surrounded by area home schooled students as he roasts sausage on an open fire at the Battle of Aiken.